We are proud to share that we have been awarded the National Distributor of the Year award at the recent Foodservice Packaging Association (FPA) Awards. The awards ceremony, which was held on Thursday 10th March at The Grand Hotel in Brighton, was attended by 460 FPA members and their guests, and hosted by comedian and broadcaster Paul Sinha. Bunzl Catering Supplies take home the award for the third time in four years, after being selected as the winners of the award in both 2013 and 2014. Judged by an independent panel of experts across the FPA, this year’s awards saw the most entries ever received. 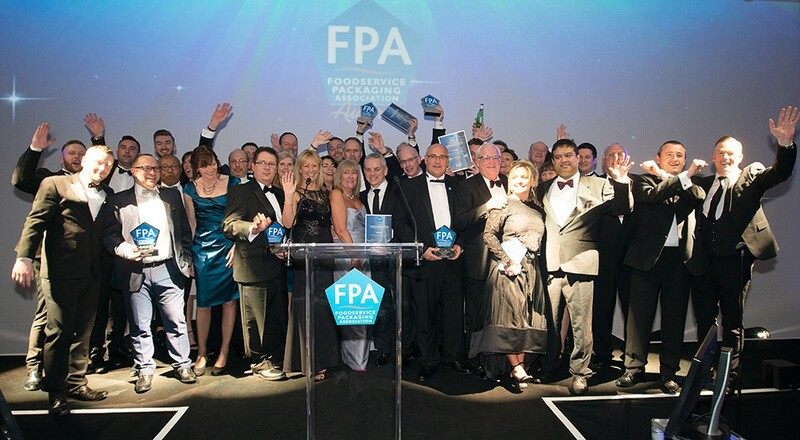 The FPA Manufacturer of the Year 2016 Award, which was sponsored by us and won by our partner supplier: SCA Hygiene Products UK. The FPA Chairman’s Award Chairman’s Award 2016, awarded to Greg Fitchett of CMC Daymark for dedicated service and inspiration to the foodservice packaging industry. The FPA Marketing Award 2016 given to Wrap Film Systems for the ‘Wrap Smart’ campaign. During the event, a charity auction and raffle raised more than £10,000 for Hospitality Action and Springboard.